A guide to obtaining the new ascended amulets and utility infusions introduced with the Flame and Frost Prelude patch. 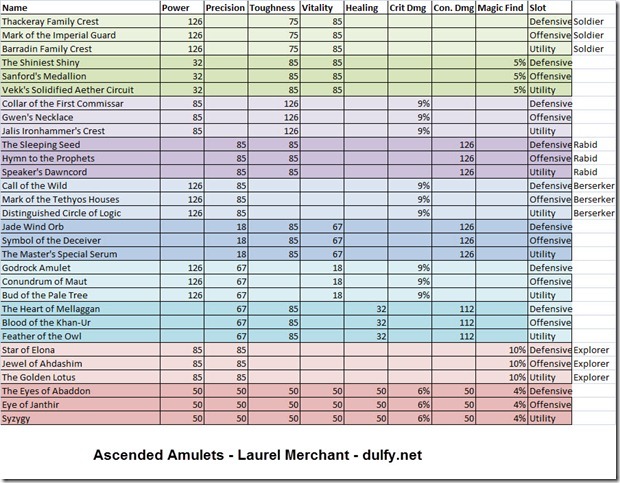 All of the ascended amulets, rings, and infusions can be purchased from the Laurel Merchant near the WvW gates in Lion’s Arch and also at major cities (look for the laurel symbol on maps). These utility infusions only go on ascended amulets currently as these are the only type of ascended gear with utility infusions. These infusions can be brought for 5 laurels off the laurel merchant but do not come with any agony resist. Defensive/offensive infusions with agony resist are only crafted or brought from the FOTM dungeon vendor. I have a question. If you put one of these infusions into a non infused Fractal Capacitor would it make it into the shiny infused version saving 250 Globs of Ectoplasm? The infused version allow you to get +10 agony resist on a single capacitor since it has a +5 agony resist already on the item and have an additional free slot for an infusion. Having an infused capacitor isn’t the same as slotting in an infusion into the capacitor – these are different processes. Ow thank you for clearing that out for me 😀 Keep up the amazing work! why is there no cleric rings back items or aumelets , asended ? Not sure, but ascended items are lacking + healing gear. there arent valkyrie gear either, and i am really SAD!!! What is the point of the quasi-Berserker prefix that trades off a bit of Precision for Vitality? They should remove these prefixes and put in the ones that matter but are unavailable, like Knight’s. Just need some advice. 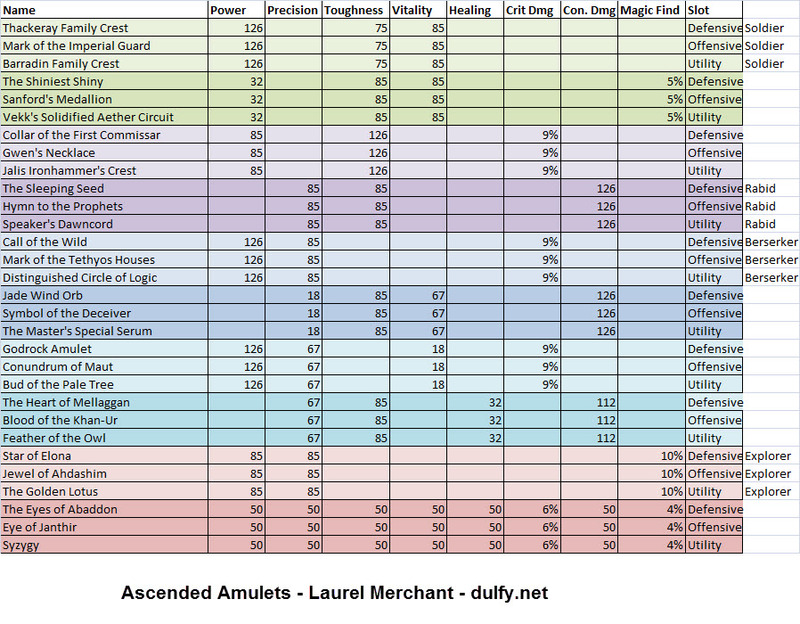 Stat-wise is it better to have the Triforge Ascended Amulet or the Ascended Amulets from Laurels with the infusions?Cost being no object. Ah tyvm .. ..save me some gold then. whats the point of +20% exp if the level req for these is 80? What do you guys think will be a better utility infusion, + gold or +mf? Unless you want to buy an infusion for ar, the +4 to stats is obviously not worth it… Just not sure which will be more lucrative. Well, it is hard to say. +gold is guaranteed – if the mob drops gold, then you gain value from that infusion. +mf is well, still RNG. You may get lucky, or it may feel like a waste. Personally I would go for the gold, never really like mf much. I’m not sure if I understood correctly. Is that possible to add an agony resist infusion (crafted in mystic forge) to an amulet bought from a laurel merchant? Yes, it is definitely possible. Make sure to buy the amulet with the same slot as your infusion. Guess none can give me a 100% sure answer until we test it in the next days but i would like to ear your opinion: are Versatile Simple Infusion compatible with amulet’s Utility infusion Slot ? If they are why in the hell sould i buy an amulet with defensive or offensive infusion slot ? Is it tested that these amulets can not be infused in some way similar to the rings , so that they gain an inherent +5 AR ? Yes people tried the traditional way to infuse them but that didn’t work. I think these amulets are not intended to be infused since they are obtained outside the FOTM. Again, thanks for your hard work ! 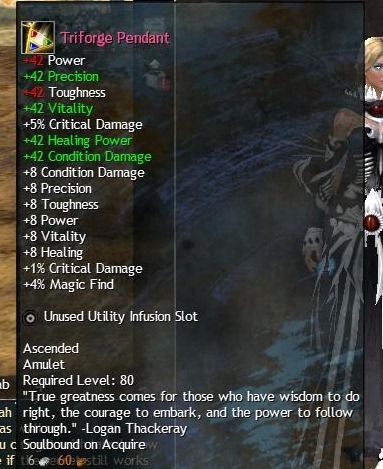 So utility slotted amulet can be upgraded with versatile infusion? Question. for agony can you infused it into any type of infusion slot? Thank you, this simple summary for these Laurel items was exactly what I was trying to find. Always nice when the GW2 community comes through with info when it isn’t in a straightfoward format in the game.